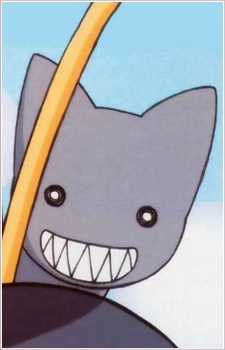 Kamineko ( "Biting Cat" in Japanese) is a cute gray cat that Sakaki occasionally sees on the way to and from school. Having a great soft spot for cats, Sakaki tries to pet it, but it ends up latching its huge, beartrap-like teeth onto her hand. This becomes one of the series' biggest running gags. Kamineko seems to bear Sakaki strong malice, and at one point attempts to rally an entire neighborhood's worth of cats to attack her. Tomo has somehow managed to get her hands on a plush version of Kamineko, complete with bear trap teeth.